A fireplace is wonderful for warmth and ambiance this time of year. An electric fireplace is a fabulous and portable way to add one to a home that doesn't have one. 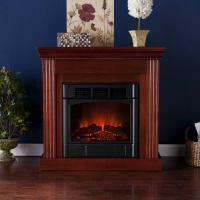 One of our favorites is Holly & Martin's Contemporary Petite Convertible Mahogany Electric Fireplace. It gives the look of a fireplace without the mess, venting or hassles. This versatile fireplace is complete with a collapsible panel, making it easy to place against a flat wall or in a corner. Requiring no electrician or contractor for installation allows instant remodeling without the usual mess or expense. Perfect for a living room dining room or bedroom. For more details visit www.cheapchicdecor.com.